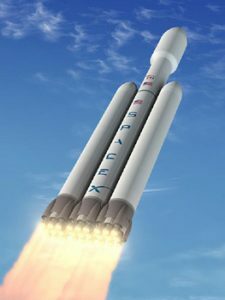 The SpaceX Falcon Heavy Booster: Why Is It Important? The announcement of the Falcon Heavy in early April, 2011 was a potential game-changer in the space launch industry. The Falcon Heavy is slated to launch twice the payload of the Shuttle at about one-fifteenth the cost of a Shuttle launch — an approximate 95% reduction in launch costs compared with the Shuttle! Many months after the Falcon Heavy announcement there is still confusion about its significance, and in some quarters outright disbelief remains regarding the launch prices actually posted on the SpaceX website for the Falcon Heavy. No other company has posted fixed launch prices on the Internet — only SpaceX. The actual taxpayer cost of US government launches can only be guessed by calculating from the cost-plus contract costs, which are usually for multiple launches from the same customer. If SpaceX does multiple launches, the posted price would be reduced depending on the number of launches. Almost any commodity’s price decreases if production rates increase. Rockets are no different. What amazes people is that SpaceX has broken the long-sought 1,000 dollars a pound to orbit price barrier with a rocket which is still expendable. “How can he (SpaceX CEO Elon Musk) possibly do this?” they ask. The Chinese have said flatly that there is no way they can compete with such a low price. It is important to remember that this was not done in a single step. The Falcon 9 already has a large price advantage over other boosters, even though it does not have the payload capacity of some of the largest ones. The “Heavy” will even this score and then some. At last count, SpaceX had a launch manifest of over 40 payloads, far exceeding any current government contracts, with more being added every month. These are divided between the Falcon 9 and the Falcon Heavy. The Falcon Heavy is similar in conformation to the Delta 4 Heavy, which is the only rocket currently in service that is fair to compare to the Falcon Heavy. The “Heavy” will consist of three Falcon 9 stages strapped together (two side stages and a core stage which has a small upper stage and payload with fairing). The Falcon stages are stretched and the nine Merlin engines on each will be upgraded to have more thrust than the current engines. With a total liftoff mass of 1400 metric tons, it will put 53 metric tons into a standard 200 km Earth orbit at 28 degrees. (The 200 km orbit is a standard orbit to start from, for example, for injection into a geosynchronous transfer orbit — payloads are not left in this 200 km orbit.) Each of the “Heavy’s” three stages are about 12 feet in diameter, so based on data from the Ares I, the payload fairing could be up to 18 feet in diameter. The currently proposed shroud diameter is 17 feet. The total thrust at liftoff will be 3.8 million pounds or about 1700 tons, or 50% of the Saturn V’s thrust. This will make it the world’s largest and most powerful operational rocket once it has flown. The first flight is anticipated in 2013 from Vandenburg Air Force Base in California. A 10-fold reduction in cost per pound to orbitTo fairly compare the two rocket performances, you really have to look at the numbers. Although the Falcon Heavy looks similar to a Delta 4 Heavy, its performance is much higher and, simultaneously, its cost per launch is much lower. It can put 53 metric tons (117,000 lbs) in orbit compared to the Delta 4 Heavy’s 23 metric tons (or 50,600 lbs), a 230% improvement. At the same time, it only costs about $100 million per launch, while the Delta 4 Heavy launches cost $435 million each (calculated from an Air Force contract of $1.74 billion for 4 launches). Comparing the payload costs to orbit is useful here. The Delta 4 Heavy can put up 23 metric tons at about $19 million/ton or $8600 per pound). If it could put up 53 metric tons at the same price per ton, then that payload launch would cost almost exactly 1 billion dollars. Since the Falcon Heavy’s posted price per launch centers on 100 million dollars (and the corresponding payload price is about $850 per pound or $1.9 million per ton), it is easy to see that the future (< 2 years) price of a commercial Falcon Heavy launch per unit weight is almost exactly one-tenth of the current Delta 4 Heavy price. A different calculation method yields the same result. If we use the same average posted price value of $100 million, the Falcon Heavy actually can be launched for about one-fourth the cost of a Delta IV Heavy (4.35 times cheaper per launch), yet it carries 2.31 times as much payload! This means the current cost per pound to LEO for the Delta IV Heavy is 4.35 times 2.31 = 10.05 or almost exactly 10 times more expensive (by multiplying the two ratios together). When people see this cost comparison, they ask all over again “How can he (Musk) do that?” How can the Falcon outperform the Delta by such a wide margin? The three main reasons seem to be (1) low manufacturing cost (2) low operational cost (time efficient operations design and low man-hours needed per launch) and (3) high efficiency performance in flight. The first two have already been demonstrated by the Falcon 9, and they continue to be improved, such as a recently announced two-thirds reduction of fuel loading time. The SpaceX paradigm is one of continuous improvement. The third reason (high efficiency in flight) is partly achieved by the standard methods of making the engines fuel efficient, with high thrust and low mass, and making the overall structural mass of each stage as low as possible. Musk has apparently done this better than anyone else. For example, the two side boosters have a fully fueled to empty mass ratio of 30. Additional flight efficiency is achieved by propellant cross-feeding (see below). The Falcon rockets also use a short upper stage which consists of a single Merlin engine to place the payload into orbit. Musk has been talking about creating a hydrogen-oxygen upper stage, which could boost the total Falcon Heavy payload close to the minimum for a “true” heavy lift vehicle, or about 70 tons. This engine could enter service before 2015. Part of the Falcon Heavy flight efficiency is achieved by a method that has been known for decades, but no one else has been willing to attempt to implement it. This method is called propellant cross-feeding. All three Falcon boosters use full thrust at takeoff to lift the massive rocket. During flight, the outer two stages pump part of their propellant into the center stage. They thus run out of propellant faster than you would expect, but the result is that the center (core) stage has almost a full load of propellant at separation where it is already at altitude and at speed. Unfortunately, very little information has been released on the cross-feeding system to be used by the Falcon Heavy. It would only be used for payloads exceeding 50 metric tons. The cross-feeding scheme used by Space X apparently does not pump fuel into the tanks of the core stage. Instead, the three core-stage engines next to each side booster are fed directly from the side booster’s tanks. This is very similar to how the shuttle’s external tank feeds the shuttle main engines (SMEs). In the case of the Falcon Heavy, of course, the two side booster’s tanks are feeding propellant to 12 engines instead of 9, so they run out of propellant faster. At some point after liftoff, of course, you do not need the full thrust of all 27 engines to maintain acceleration, as much of the mass (propellant) has already been used. The core stage engines will then apparently be throttled down while the side stages continue to burn at full thrust. Presumably, only the center three engines in the core stage are using propellant from the core stages tanks. Thus, when the side stages separate, most of the core stage’s propellant is still there, and then all the core stage engines can burn at full thrust. Assuming that the core stage is going several thousand miles an hour at separation and is perhaps 30 miles high or more, it is as if an entire stretched Falcon 9 rocket starts its liftoff at separation. Separation of fuel lines like this occurred every time the external tank separated from the space shuttle and when the old original Atlas shed its two side booster engines. The Falcon Heavy, when it enters service, creates a new payload weight class. This capability can be exploited in multiple ways for existing payloads, such as launching more than one communications satellite in a single payload. The large payload fairing gives payload designers a lot of room for their payloads, which do not need to be as compact, and can thus be wider and more than twice as heavy as a shuttle payload. The Falcon Heavy also opens up a window to much larger, heavier payloads. Much concern was expressed after the last shuttle launch about the loss of the shuttle’s lift capacity. The Falcon Heavy will be able to place more than two shuttle payloads in orbit in one launch at about 1/15 of the price of a single shuttle launch. The only thing missing is the ability to move items placed in orbit to a specific place where you want them, such as the space station. The Dragon capsule (and the other smaller delivery vehicles) will cover that for smaller supplies. For larger items such as new habitats or instruments, just two large payloads, a Low Earth Orbit space tug and a propellant depot, would solve the problem. This would allow much larger space station modules to be launched and thus allow new additions to the station. The Large Centrifuge Facility is the most critical item that was deleted during the multi-decades of budget-cutting that affected the station. It is still a vitally needed module to allow studies of mammals in low gravity fields to prove that we can colonize Mars. Also, additional crew habitat and laboratory modules were originally planned and then cancelled. The only shuttle capability that the Falcon Heavy (and its payloads) would not provide is the ability to return large objects from orbit, but this has been rarely required. Considering that the cost of shuttle launches has recently been pegged at $1.5 billion apiece, (about $75 million per ton of payload), in most cases it would be far cheaper to build a new payload than to bring it back in a shuttle. There are many other large payloads that a Falcon Heavy could launch that do not involve the space station. With a 53 to 70 ton payload, a very large optical space telescope could be orbited to replace Hubble. Discussions are also underway for a potentially low-price-shattering Mars mission which would use a Dragon capsule to land deep drilling and other robotic equipment. The mission would presumably use a higher energy (hydrogen/oxygen) engine along with an enlarged upper stage to boost the Dragon to escape velocity toward Mars with the robotic drilling equipment inside. Since the Dragon plus its payload would be over 10 times heavier than any previously landed payload, it would have to use newer methods of decelerating in the atmosphere before landing on Mars. A modified Dragon capsule could also potentially be the basis of a much cheaper Mars sample return mission. Fifty tons to orbit has been an assumed minimum unit mass for practical construction of space solar power. Even with the Falcon Heavy to launch the equipment, space solar cannot yet compete with coal or nuclear power, but even now, it could compete with ground solar or wind power, especially if intended for base load supply. Five Falcon Heavy launches could place 250 tons of solar panels in Earth orbit. An additional launch could orbit a solar powered ion or plasma tug, which could move the equipment to Geosynchronous Earth Orbit, avoiding the huge penalty of using liquid fuel to reach the higher orbit. Alternately, a single “Heavy” launch could place a single prototype 50-ton powersat in orbit to be used as an emergency power supply. This could be enough to supply about 10 megawatts to disaster sites over an entire continent via laser beam. For human missions beyond LEO, the Falcon Heavy could launch a long duration Dragon capsule (about 10 metric tons) attached to a 42 ton crew habitat, or an Orion (21 metric tons) attached to a 32 ton habitat (these numbers do not include propellant to reach escape trajectory, which could be obtained from a propellant depot). Either configuration would be suitable for an asteroid mission. Decades ago, the US lost most of the world’s market share of commercial satellite launches to Europe and Russia, along with a large number of jobs. The existing large US companies launch almost exclusively for the US government. This situation is now starting to change, with the realization that much lower launch costs are possible with high reliability. Both the commercial communications satellite makers and the government are now taking a close look at the upstart company, realizing that soon they will be able to launch 10 tons for the price of one. This will affect the US balance of payments, the US job market, and the level of confidence in our own ability to build commercial rocket launchers. It may encourage the existing large rocket companies to innovate and reduce launch costs for their own vehicles. The new entrepreneurial jobs may soak up some the laid-off NASA personnel and contractors. Needing fewer personnel to build and launch rockets will open job opportunities in spacecraft construction and other areas. A reduction of expenditures for space transportation to orbit will eventually allow more expenditures on space transportation in and beyond orbit. Elon Musk has indicated that he is not interested in building re-usable winged vehicles, but that he is interested in recovering his boosters for re-use, which he admits is a really tough challenge. The primary current problem being faced is structural breakup of the first stage due to dynamic pressure during entry. The side boosters of the Falcon Heavy would be good prospects for recovery attempts as they would have relatively lower velocity at stage separation. It may be possible to prevent damage during entry by using attitude control to keep the stages aligned with the entry flight path, stiffening the structure of the rocket bodies, and protecting the engine compartments. Recovering the second stage of the Falcon 9 would require full re-entry protection, but this stage is easier to stabilize during entry. The core stage of a Falcon Heavy would be the hardest to recover due to its high speed and length. Musk’s National Press Club announcement of September 29th, 2011, shows that the recovery plan includes having the first stage actually reverse course and land vertically back near the launch pad. This means the rocket has to cancel all eastward velocity and gain westward velocity, as well as decelerating the vertical component during landing. This would require a significant amount of delta-V that would reduce the payload capacity of the Falcon 9, but with the Falcon Heavy, which has extra payload capacity and where at least two first stages would be recovered, the payload size reduction may not be that big an issue. If a launch site could be found with an island in the right location downrange, payload capacity could be gained while still recovering the stages. The actual landing would take place with extendable landing legs on a level surface (without a flame bucket) and would use only a single engine. SpaceX has posted a video of the proposed recovery system. We will not know how successful this system is until there is a successful landing and evaluation of a stage’s condition. The first SpaceX recovery concept involved a water landing, which would have subjected the engines to severe salt water corrosion. Since the current prices are based on no recoveries, any recoveries should allow significant launch cost reductions. SpaceX would presumably have to demonstrate a launch using the recovered stages before a paid launch, just as it has already done with all of its vehicles. Musk has publicly pledged to continue his efforts for both lowering launch costs and improving capability, so the currently described version of the Falcon Heavy is not likely to be the “last rung” in his launch ladder. With 53 metric tons of payload, the Falcon Heavy is not considered a “true” Heavy Lift Vehicle (HLV), which is generally considered to be one that can lift 70 metric tons or more. NASA’s Space Launch System (SLS) is an HLV that is slated for an initial version that can lift 70 metric tons and a later version that can lift 130 metric tons. SpaceX, however, has expressed confidence it could build a Falcon “Super Heavy” launcher with a 150 metric ton payload capability and a cost per flight of $300 million. This results in a launch cost of $1,000 per pound, which is close to the per-pound cost of the Falcon Heavy but with a payload three times larger — a payload even larger than the largest payload projected for NASA’s SLS. “We’re confident we could get a fully operational vehicle to the pad for $2.5 billion — and not only that, I will personally guarantee it,” Musk says. In addition, the final product would be a fully accounted cost per flight of $300 million, he asserts. “I’ll also guarantee that,” he adds, though he cautions this does not include a potential upper-stage upgrade. Musk has also made public statements about SpaceX plans to send humans to Mars in the next 10 to 20 years. Landing humans on Mars will take much larger in-space vehicles, some of which would require a 15 meter diameter faring which in turn requires a 10 meter diameter booster. No currently proposed heavy lift booster is this wide. Musk’s interest in Mars as a destination provides reason to believe that he will attempt to produce a cost-effective booster capable of launching Mars-bound, crew-carrying vehicles within 10 years. Significant announcements from SpaceX can be expected as long as the company’s successes continue. **Delta 4 Heavy cost calculated as one-fourth of a $1740 million Air Force contract for four Delta 4 Heavy launches for 2012 (Delta 4 Heavy price per launch is not posted). Government costs for a single Delta IV booster (not heavy) with a Centaur upper stage are about $155 million.